Okay. I know what you’re thinking: There is absolutely NO WAY virgin coconut oil can change my life in 3 ways, G. You’re a crazy person. My hands are up, curl friend. You’re right… It will do even more! 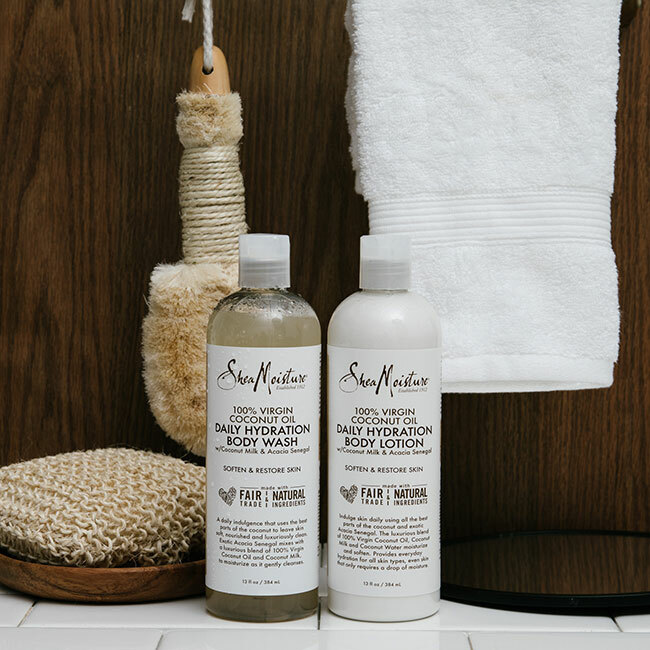 Scroll along with me into the magical world of SheaMoisture’s 100% Virgin Coconut Oil collection to learn how it will be the new breath of life for your hair, skin, and soul. #1 - FALL IN LOVE WITH YOUR CURLS, OVER AND OVER, AGAIN. Naturalistas like you and me are deeply involved with the care and moisturization of our roots and strands, sometimes on a daily basis. We will not settle for any old ingredients or product, our curls demand the best. That’s why I know your curl-lovin’ life will be forever changed by the 100% Virgin Coconut Oil Leave-In Treatment. You don’t have to worry about product buildup with virgin coconut oil because your hair will soak it in with the greatest of ease, and a little goes a long way to maximizing moisture. This is so great for us curlies because, like fellow naturalista Ashley Hall says, “Leave-in conditioner is probably one of the most important steps in maintaining healthy hair. It replenishes the hair’s moisture after washing, and it aids in softness and manageability.” We can have it all! Do you love that feeling of your melanin poppin’? Freckles on fleek? Skin on a full-on #glowup? Me, too! If you haven’t already grabbed the 100% Virgin Coconut Oil Daily Hydration Body Wash, I’m telling you now that you need to. My skin tends to be dry thanks to the Texas Hill Country climate, so I love to use hydrating body washes that protect my skin before I even put on a layer of lotion. This has been my go-to body wash, and if you experience dry skin (no matter where you are in the world), you need this in your shower caddy! It’s been said that daily washing is the enemy of natural hair, but I think that with the right products, your curls will love you for the daily cleanse. That’s why I recommend the 100% Virgin Coconut Oil Daily Hydration Shampoo for those of us that lead an active lifestyle filled with workout sessions and miles-long jogs, or those that simply love how their hair feels post-cleanse! The unrefined, virgin coconut oil is what your hair strands crave, and if you have low porosity curls, the oil is able to penetrate those strands without leaving a hard-to-rinse-off residue; it’s just right! BONUS – EMPOWER WOMEN EACH TIME YOU BUY! You and me, we’re well-informed women! We know that every dollar we spend on our favorite products is a sound investment. So, what if I told you that every time you buy any of the items from 100% Virgin Coconut Oil collection you are empowering women? The possibilities to empower women all over the globe are boundless! Want to help a woman get started on her journey? Well, there’s no time like the present: Get your 100% Virgin Coconut Oil collection today! This post is sponsored by SheaMoisture.